Beautifully constructed of sterling silver, this stylish compact features a magnificent embossed deco design on the top, and a circular pattern on the back. The inside is fitted with a glass mirror and powder liner. The mirror is fully intact, but shows moderate signs of aging, and the only flaw on this piece is a very minute indentation on the top. 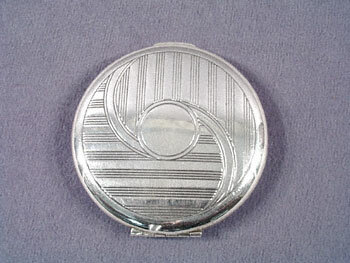 This fabulous silver compact measures 2-1/2" diameter, is in excellent condition, and is marked "sterling".